“Research on recovery is now a multinational, multidisciplinary and multimillion dollar activity, the progress of which can be charted through numerous conferences, in several major books and, more recently, in the emergence of journals devoted to this area --- ” (Rose & Johnson37). That this investment of expertise, enthusiasm and money has paid some dividends is clear: evidence is to be found in the pages of the present volume. Perhaps most notable is the dramatic progress which has occurred in the field of neural implantation (see Hitchcock, Sinden et al., and Stein and Glasier, this volume). Two decades ago the focus of this area of enquiry consisted of just a handful of published reports. 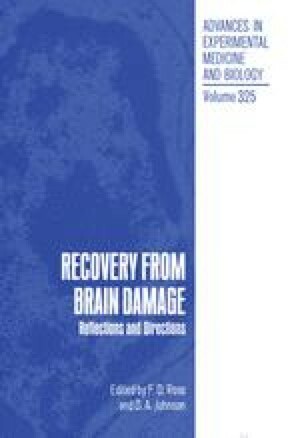 Now there are hundreds of publications on the subject and, whilst there are many problems still to resolve, we have a considerable appreciation of the mechanisms underlying successful implantation, the effects of implantation on the host brain and the possible role of such effects in restoring impaired function.